Want to learn to make cheese? The mystery of the cheesemaking world has been exposed. 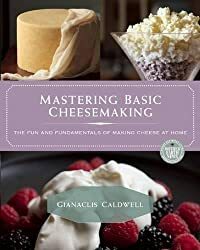 In her newest book, Mastering Basic Cheesemaking, artisan cheesemaker Gianaclis Caldwell demystifies and simplifies the whole process. This book is my new #1 recommendation for anyone who wants to learn to make cheese. This is basically cheesemaking school in a book. Gianaclis starts by explaining the “fundamentals of making cheese” in 39 pages. This information will serve you well through your cheesemaking adventures. Then in 19 lessons, she takes you, step by step, from the most basic acid-ripened, fresh cheeses through rennet-coagulated cheeses to the more complicated, cultured, aged cheeses. This book will be useful to anyone who wants to make cheese, regardless of whether they have their own milking animals or not. One of the many things that sets this book apart from the others is that it’s 8 1/2 by 11 inches. It packs a ton of info into a relatively thin book that will easily lay open on your counter. There is nothing worse than a small, thick book that won’t stay open when you’re trying to follow directions! There is also a lined page for notes at the end of most chapters. Gianaclis recommends that you keep a cheese journal. I wholeheartedly agree! My learning curve with cheese would have so much easier if I had started writing down everything from the beginning. It took me five years to learn to make a predictably good chevre because I wasn’t keeping track of what I was doing from one batch to the next. What kind of cheese can you learn to make? Instructions are included for ricotta, mascarpone, paneer, quark, chevre, cream cheese, cottage cheese, feta, gouda, colby, parmesan, and several types of cheddar, as well as buttermilk, sour cream, creme fraiche, buttermilk, ghee, kefir, and yogurt. At the end of the book, Gianaclis gives you an excellent list of references where you can continue your education. If you want to learn to make cheese but don’t have the time or money to travel to a cheesemaking class, this is the book for you. This post contains affiliate links. This means that if you purchase something after clicking on a link, I’ll make a small percentage while you still pay exactly the same amount as you otherwise would. Thanks for your support. I would like to learn how to make feta cheese, it’s my favorite cheese of them all. Mastering Basic Cheesemaking looks amazing! We go through cheese like air and have goats for their delicious raw milk…homemade cheese is the next step (gulp!) Feta, parmesan, and cheddar are a few favorites –Swiss, Mozzarella, Provolone, and Pepperjack are amazing, too. But starting with feta and cheddar sounds like a perfect start! I love all of her books! I need a copy of her newest to complete my cheese making library collection! Yay! I’ve made paneer, ricotta, etc at home but never anything cultured or aged. Excited to learn more! I would love to make cheese! We have spent so much time learning soapmaking and goat husbandry, I haven’t had time to look for that ‘perfect’ book. This would be great! I have always wondered how cheese is made? And it has been my wish to make cheese with fresh milk and share it with family and friends. I know very little about this and am proud to start this with this great book! I always look forward to Ms Boehle’s choices, they are amazing as herself. I have one of her other books and it is amazing! I am looking to try more advanced cheeses and this would be a great tutorial. We are definitely wanting to learn what to do with all this milk! I always wanted to learn how to make cheese! I’ve even had dreams of it for years! I decided this year I was going to learn and I have started my journey! Your book looks like something that would help me, Linda Peters, assist me in my goal. Thank you good luck to all the cheese lovers and the cheese makers! We plan to add sheep and maybe even a dairy cow to our little farmstead next year, so we can start making our own cheese!! I tried to make cheese once and it was a disaster! Lessons from a master are just what I need! I’ve learned so much about goat husbandry through your books, blog and forum and now I’m ready to try my hand at cheese making! Thanks for the book recommendation and chance to win it! I have been trying to find a comprehensive book like this! I cant wait to see it. I have had my dairy goats for about 5 years now and while I have become very comfortable in my soap making, I still feel very intimidated with cheese making. I would love to have this book! I have never made cheese, but would like to learn. I have made yogurt and Keifer before. I’ve made fresh mozzarella and ricotta before, but I’d like to branch out and try some new things! I’ve never made cheese before, but I’ve eaten more than my fair share over the years. Early use a good book to help me make goat milk cheese! Thanks. I would love to add this book to my collection. Homemade cheese is the BEST!!! Especially when the milk comes from my own small Nigerian Dwarf herd. When it comes to cheesemaking, learning never ends. I have been making cheese for just over a year using my own goat milk and am loving the adventure! Have been dreaming of making cheese! So excited to learn to make cheese ! I have never made cheese before but it is on the ‘to learn’ list by spring as I will have my first Nigerian Dwarf kidding! I have Gianaclis’ earlier book “Mastering Artisan cheesemaking”, and I love it. So I can’t wait to read this book. Some years ago we took a cheesemaking workshop with Gianaclis at the Heirloom Seed Festival in Santa Rosa CA, and we were hooked on cheesemaking after that. Gianaclis is so encouraging and inspiring both as a cheesmaker and Goat owner. That workshop led to a farm visit the next year. We have learned so much from Gianaclis on cheesmaking and owning Nigerian Dwarf goats. Never made cheese and would love to learn. The winner is Kitty S. I’ve sent her an email, so if that’s you, check your email! Congratulations!